The journey to become a Jedi is undoubtedly a difficult one. Countless have struggled and many have failed. Traditionally, the journey to discover the force is walked with a guide, a mentor. However, Duncan Therin walked this path without a Master to call his own. Where others would of been aided and nurtured, Duncan had no such counsel. Indicative of his endless determination and unwavering resolve to achieve his goals, Duncan is known for staying true to himself despite all adversity, and thriving in the face of it. Ultimately, a friendly face who experienced the trek differently than most, he is in the rare position of saying that he undeniably earned his position on his own. It’s easy to stick to the crowd and follow tradition, it takes unrivaled courage to stand alone against it. Far away from the rest of populated society is a planet called Sembla, Utavurk in the native language. In a remote corner of this planet there is a tribe. This tribe happens to house a young Vurk named Duncan. A rather irregular name for his species, though this is largely because of the mother and father naming their child after a human man who had once provided a great service to them. Duncan is a rather peculiar child among his tribe, he has a quirky personality that is uncharacteristic of his people. However, the Vurk people aren’t necessarily strict and uptight – traditional is a perfect word to describe them. Familiar with and respect other cultures, though hold true to their own ideals. Duncan is a regular physical specimen of his species, he has six fingers in total, a long cartilage filled fin of sorts on his head, no actual ears. He was the common in terms of physicality – or, at least, that is what everyone thought. As it turned out, Duncan had a far more unique destination in life, beyond his homeworld, something that would lead him through happiness and sorrow, grief and mourning. This is the story of Duncan Therin. Sembla happens to have a rather varied set of land, graze lands and fields, volcanoes and deserts, mountains and oceans. It is because of this natural ability to breath underwater as well as this varied climate that the Vurk people travel around so much, roaming, and why it is encouraged that children of the tribe go about and experience each of the different environments. This day, Duncan and his brothers went out to swim, something very common place. As they made their way out, into the ocean, they swam out further than they normally did, out of sight of the shore and their tribe. It is perhaps for this reason that they encountered far more than they ever expected to. They began to dive underwater, playing as children normally do. However, something was wrong. The normal sea creatures, such as fish, seemed to be missing from this section of water for as far as they could see. Suddenly, a small wave came down on the three children, a number of ripples surrounding them in the area of water that they were in. Rogziel decided to dive under once more, as all of them were confused and Rogziel as the eldest decided to take a look. A minute passed before Rogizel resurfaced, giving a simple shrug to Duncan and Treb. Suddenly, Rogziel was pulled under the water with a great deal of splashing about, the pair that remained were startled and unsure of how they should proceed, yet they dived down in an attempt to rescue their brother from whatever this menace was. They immediately saw him through the water, their eyes widening as they observed the situation. It appeared as though Rogziel was tangled up with a giant fish, at least four times the size of the three combined. Treb, without a moment of hesitation, propelled himself forward in a foolish attempt to headbutt the creature – this ended poorly. The creature was momentarily distracted, Rogziel floating away as it turned towards Treb, swatting it away. The creature then laid narrow, yellow eyes on Duncan. Duncan looked around frantically before swimming forward to reach one of his brothers before his path was cut off by the creature, violently snapping at Duncan. The creature had hold of him, the strength of the creature was tremendous, nearly suffocating Duncan’s esophagus. Duncan’s eyes were wide, more awake than he had been ever before – then, suddenly, something happened. Duncan yelled, the water muffling his voice. Duncan was released from the creature’s grip, all he could see before he slowly blacked out was the creature swimming away with haste. Duncan’s eyelids closed shut as he lost consciousness. Slowly, he opened his eyes. He was unsure of exactly where he was before recognizing his surroundings. It was his family yurt, his father sitting on the edge of his bed, his mother off in the corner and two brothers sitting at a table. Oddly enough, there were two other figures in the room as well, both had their arms crossed, near the entrance. Both were human, in what could only be light armor, one male and one female. As Duncan rose his head, his brothers rushed to him, practically pouncing on him as they hugged him. His mother and father let out a sigh of relief as his brothers recounted what had transpired. As it turned out, when Duncan had yelled, he had done so much more. Rogziel and Treb felt the effect themselves, even underwater. There had been a burst of sorts, a great push, nothing of tremendous harm yet shocking nonetheless. This is what sent the creature reeling and off back into the depths of the ocean. It is from this point that Duncan’s brothers recovered him and brought him back to shore, eventually making their way to their parents. From this point, the three brothers were cared for, patched up and healthy. A pair of people took notice as they strode about the tribe, looking to trade for local supplies as they stopped off nearby on a ship. It turned out that these people were Watchmen of the Jedi Order. After they saw the children, they immediately followed and were invited in after they told Duncan’s parents who they were. After the story had been recounted, the Watchmen knew that Duncan was Force-Sensitive, his act having been that of a demonstration of Telekinesis. It was a reaction in the moment, explaining the spontaneous nature of the act. After the group had discussed, it turned out that Duncan had a choice before him – to leave behind his family and tribe for something different, something foreign. The Jedi Order, to be trained as a Jedi student, though Duncan knew nearly nothing of the Order and wasn’t quite aware of what had happened, his parents encouraged him to go with quaking voices. His answer was yes. Duncan made his preparations as he gathered a few of his personal items, including a small piece of bark from a tree on Sembla. The two Watchmen made their back to their ship with Duncan, they shortly boarded after accommodations had been made. As the ship fired up its engines, Duncan couldn’t help but think of all the new possibilities that he would have, all the new people that he would meet. Though he was still young and ultimately unsure of quite where he was going, he knew that he would bring about a new kind of personality to this foreign place. He looked out the window of his cabin and smiled as he watched the ship lift off and go into orbit, setting his items aside and laying down on the bed in his quarters as he dreamed of everything that could happen. After a few days of travel, what with the galactic wide ban in place due to the plague going on at the time, Duncan arrived at the Yavin IV branch. Though one of the smaller branches, the people there were warm and welcoming nonetheless, Duncan met quite a few people that he would come to appreciate over his time training, friends that would last for the rest of his life. Others would be lost to as they perish to the passages of time. He arrived at the age of eight, a fairly common age. Funny enough, there weren’t that many hopefuls at the time. He was initiated in short order after about a cycle, making friends with those of his generation, granted, they were few. The environment of Yavin is perhaps what piqued Duncan’s interest in the more mundane skills that one might have when training as a Jedi. He soon came to love climbing and swimming, though he was naturally inclined towards swimming given his species. He eventually progressed, at older ages into free-running, a rather dangerous thing to do though a good exercise, the danger would be far less given the fact that he could and would augment his leaps. It is because of this fact that Duncan would go on to be very interested in the augmentation of his body, studying it to a level beyond the normal. Duncan would come to make many friends in his time, many of which he would come to respect. He continued his studies on Yavin, learning a lot about the basic Jedi principles and doing basic work in areas such as Telekinesis and Augmentation. He was present for the interview where High Councilor and Jedi Master Sebastin Creed revealed that the Order has had the cure for the plague that had been running rampant. In short order it was distributed to the residents of the enclave. Shortly after, the location on Yavin was deemed unsafe as a war with a new upstart, the Imperium ensued. It was a faction of soldiers and Sith, a fascist government and they quickly seized many planets and systems. It is because of the close proximity and known location of Yavin that the Order decided to relocate to Rannon. The trip was not without trouble, however, as the Yavin Branch was attacked before leaving by the Sith. This ended with the retreat of the Jedi there, though not without casualties, many people injured a another dead. A girl named Elensa Jari, to be precise, a girl Duncan had little interaction with though that didn’t matter. It simply showed how brutal war could be. What with the move to Rannon complete, Duncan continued his training in a new atmosphere. He saw a number of events transpire, the advancement of the war, the promotions and Knightings of a number of fellow peers. He learned new abilities, socializing with those around him as he continued to keep a positive attitude and a quirky personality, one that he had retained since he had on his homeworld. After a short number of years, Duncan, along with Ilaine Strias and Deija Qour, were noviced. A system that is no longer used, a set of trials that would determine if an initiate is ready to progress to be taken on by a mentor. As a matter of fact, Duncan’s group was the last to take the initiate trials. It is at this point that Duncan became available to be picked up as a padawan and be formally trained by a mentor. After a couple of years, he would find that his desire to receive a mentor would be fulfilled. As temple life continued, eventually Duncan began to interact with a Jedi Knight named Motoko Isawa. A long standing member of the Order, after several cycles of speaking and informal training, Motoko offered to take Duncan on as her padawan. Duncan accepted without hesitation, as the pair had bonded over the time. He was unsure of the new responsibilities that would be put on his shoulders as a padawan learner, his training would certainly become more intense. Motoko happened to be a knight known for her strict regimen and practicality, an interesting opposite to Duncan who happened had the personality of a matured child, socializing and getting along with others with humor, Duncan was one of the farthest things from being serious. Something that would change as he continued his training. One day, Duncan, along with a number of his peers, took a trip to Coruscant to see the senate building in person. A great experience, especially given Duncan’s desire to learn more about the machinations of the political spectrum. Not long ago he had joined the enclave’s diplomacy department. It is here he saw his first senate guard, observing politicians of various inclinations as he strode through the halls. He even set foot in the office of the Supreme Chancellor. However, it is after the trip that Duncan spoke to Motoko, she felt he was ready for a new responsibility. A reward of sorts. He was granted a full frequency lightsaber, one from a person Duncan would later know as Ahkro Cerinla. According to Motoko, she learned the lesson of trust from this man, and though he had passed from the Order to serve in the Agricorps, she carried that lesson to the day. Duncan continued to do the legacy of the hilt proud, wielding it in a just manner in the coming years. However, training would have to cease for a short while. Duncan was called off world, back to his home planet, Sembla. Messages from his family indicated that there was some sort of tribal strife that was ensuing in the tribe. Duncan would only find out how serious this issue was when he arrived, however, for the time, he was happy simply to be seeing his family and friends again. Once he disembarked, arriving on Sembla, he found that his former tribe had been going through a time of trouble. Their old chief had passed on, the tribe becoming more violent as they decide who was to take his spot. Though unnatural for Vurks to bicker about such a thing, it is not unheard of. Duncan aided his family and his tribe as best as he could, speaking with many people. However, it wasn’t enough. At one point a crowd had amassed and as Duncan tried to quell the calls for a definitive choice on who would guide the tribe, violence struck. A spear had been thrown from the crowd that was aimed towards Duncan, though his brother, Rogziel, jumped in front of him. Duncan and his entire family, his two brothers, mother, and father, ran. They escaped from the tribal district, but not unscathed. Rogizel was mortally wounded. Though they were able to spend time with Rogziel in his final moments, and he was given a proper burial, the loss of a brother weighed heavily on Duncan. He had always been a role-model for Duncan, ever since he was a toddler. Duncan’s family received word that the tribe had continued with the chaotic course set before it, ultimately causing a tremendous amount of deaths. The tribe was no more, disbanded as the survivors of the chaos scattered. Duncan’s own family went to Naboo for a short respite before moving permanently to Cortella, his father setting up shop and owning a restaurant of traditional Vurk cuisine. It was quite popular. Duncan could not stay long himself however, as he went back to the Rannon Enclave to continue his training. Upon his arrival back at the temple, what could only be called regular life for a Jedi in training continued, though Duncan wasn’t quite the same person he was when he had left. Though he had only been away for a little over a year he had changed drastically. Luckily, it was not a permanent change, though it certainly felt like one at the time. He began to attend lessons and train as he had before, there was still a war raging across the galaxy. Ossus itself had been sacked, a great tragedy to the Order. Duncan, however, could do little in regard to this, so he simply continued to exist in an ultimate state of helplessness as he saw lives lost. He finally got the chance to do something more significant when Jedi Knight and long time friend, Wrennin Vae, came to him with a proposal. Shortly after this there was a call for students of the Rannon branch to aid in a relief mission. It was a planet named Lorrd where Duncan, along with a number of other peers, were dispatched to aid. They helped the citizens of Lorrd greatly, supplying them with ammunition and weapons, rations and sleep rolls. The necessities that every person needs in order to survive in a war zone. It still came as a surprise, however, when the Imperium made a hasty and surprise march on the city of Antaree. The city that Duncan and his peers happened to be in. It in that city that a battle took place, marking the defense of the entire planet, for if Antaree fell, so did Lorrd. It is also during that battle that Duncan took his first life, and not just one but many. He would come to struggle with this, eventually coming to terms with himself and the actions that he took for, ultimately, a greater purpose. It was war and death was an inevitable factor. He even encountered a Sith Acolyte, eventually transporting him back to the enclave for further processing. The galaxy may forget, but the citizens of the planet would forever remember the Battle of Antaree. Duncan still has several items that he has as keepsakes from that battle, carrying them with him to this day as a reminder of the price of war. For the next few years, things progressed at a slower though comfortable rate. Duncan had even gone on a vision quest meeting Ahrko, the former owner of the lightsaber that Duncan was in possession of. On this vision quest he confronted many things that he had gone through. Such as the death of his brother, Rogziel. The events that came of it, as well as the experiences of war that Duncan had gone through. Not long before this trip had Duncan had gone on a relief mission to Lorrd, a battleground of sorts. The Imperium had marched on the city whilst Duncan and a number of his peers were stationed there. All of these events and more, traumatic experiences in his life, Duncan confronted. Once he returned back to the enclave he had felt more at peace with his actions and the situations that he had lived through. Despite Duncan’s personal advancement in his own training, less and less came from his mentor and more from himself and personal realizations with the aid of those around him. After yet another battle, the Battle of Dantooine, one that his mentor, Motoko, had taken part in. As well as a number of other Jedi, though one was notable in the fact that he had taken his leave from the Order – Kieran Orion. A Jedi Knight of the Order, or at least, was. It is in this battle that Kieran perished and Motoko fell into a dark hole of depression. Motoko and Kieran had been close, very close. It is with the death of Kieran that Motoko could no longer continue her duties as a mentor. It was a sad moment, though the agreement was mutual that Duncan and Motoko would part ways as mentor and student. As odd as it may seem, things seemed to pick up for Duncan after this separation. He was learning a whole new set of abilities and refining those that he knew prior. His connection with the Force grew stronger as he developed not only as a practitioner but as a person. His knowledge of many things grew, from Telekinesis to manipulation of cells in his body to heal his and others’ injuries. He even took to learning an advanced form of saber combat that few at the Rannon Enclave knew – Jar’Kai, the usage of dual sabers. He learned with the assistance of Jedi Master Delmi N’jork, it is with this assistance that he was able to understand basic concepts and strikes, eventually advancing his knowledge of such as he continued. Duncan would continue to practice this form of combat, though ultimately, preferred to use a single lightsaber. Training picked up in many ways, learning histories of wars and peoples past, learning languages that he hadn’t even dreamed of beforehand. He even began to teach younger students basic subjects, eventually advancing to teaching entire classes on a number of subjects as he progressed as a masterless padawan. Overall, Duncan felt more content and accomplished as a person, for once feeling as though he was aiding in the greater scope of things, whilst also advancing himself. Training kept increasing for Duncan, he improved substantially when it came to the use of dual blades, he was no longer a novice but an adept of the art. He also found his calling, he trained in healing and passive abilities such as Tutaminis, physical and Force based. He was able to mend not only his own wounds but the wounds of others, all the while paying dues to his training with a blade and becoming a fine swordsman. His training wasn’t slowing down in the slightest since the separation, indeed, it had been ramping up. He went on several solo missions at this point as well, going on what can only be described as civilian based missions, going undercover and hiding his identity as a Jedi as he traversed places such as Tatooine and Nal Hutta, Coruscant and Bastion. He was gaining the diplomatic connections and skills that he had yearned for, even gathering materials for the time that he would construct his own lightsaber. And eventually he did begin the construction of his lightsaber. A milestone in any Padawan’s journey to Knighthood. After more than a year of meticulous construction in between gathering materials and traversing the crystal caves of Dantooine, finding his crystal, he had completed the lightsaber. It was made out of quality materials, the outer casing being made of Phrik along with a small assortment of other metals, in addition to the hilt being made of reinforced wood from Sembla, a reminder of home. 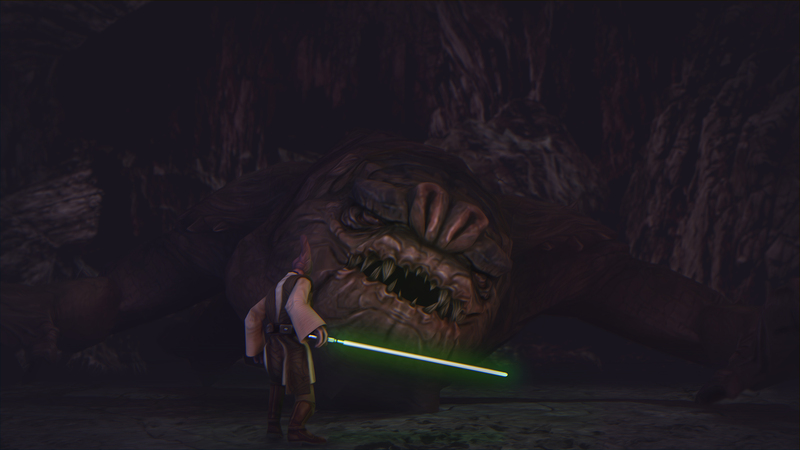 Though the most notable part of the construction was obtaining the crystal itself, he went on a journey through the caves of Dantooine, encountering what could be described as a Force Rift, experiencing the memories of those that had passed through the caves before him, treading the same path. He saw people he knew and people that were of another generation, an experience that he will carry through his life as he confronted some of his darkest and most repressed thoughts, even encountering an alternate form of himself. By the end of the trial, he had come through with a green lightsaber crystal, the final component he needed in order to finish construction. When he was done, he found a rather suiting name, from the day of completion he named his lightsaber ‘Precipice’. A department was opened up when his friend, recently knighted, became Battlemaster of the enclave. He called it the ‘Wardens’ a department that Duncan joined shortly after creation. The goal of the department would be to prepare those within it for combative situations, covering a broad amount of combat related skills. An opposite of sorts for Duncan given his intense study of more passive Force abilities. That aside, Duncan found himself more and more involved with the enclave as his training continued, helping those around him to the best of his ability, providing an ear for any troubles and a comforting shoulder. Indeed, many people would end up needing help as the war ended. The One Sith was defeated, the Dark Lord of the Sith killed and the Imperium left alone, losing ground quickly, the fascist government all but defeated. However, this came at a great loss as a number of Jedi were killed as the Sith made their final stand within the empty halls of the Coruscant temple, Rannon sending some of their own Jedi. Duncan was even there himself to aid in evacuation and aiding those that might flee from the dome that essentially encompassed the whole of the temple and killing many around it. Jedi Masters Alehk Thol and Cael Dan’kor made their way into the temple. Only Master Dan’kor made it out – the war ended, though the Sith were still in the galaxy. A threat that the Jedi must keep vigilant for. The entire Rannon Branch came together on a mountaintop to see Master Thol off, coming to learn the price of war. Throughout the war, many people were lost, many from the Rannon Enclave. But it was finally over and because of this, thing went back to some sort of normalcy. Duncan was no exclusion, he was intent on completing his training, launching himself into his studies with just as much as vigor as he had before. Time wore on as it always had in the enclave. There was always something to do, new generation flooding in. Perhaps it made Duncan feel old on the inside, nostalgic even. The war was over, yes, but the aftereffects were still in motion. Duncan had fought, bled, lost people in the war, but to know that the next generation would live in a world with relative peace – that is the goal of a Jedi. The effects of Alehk Thol’s death on Duncan was not perhaps greater than that which it had on Wrennin Vae. Both were role-models in Duncan’s life, both caring for him from a young age. As a matter of fact, it would be an established fact of Wrennin and Duncan’s relationship that, while friends, it was similar to an unofficial pairing. This was especially so after Motoko had made herself scarce. There was remorse and the enclave had learned the price of war, but there were far more lessons yet to learn for Duncan. Bearing in mind the regular routines of temple life, Duncan spoke with close friends such as Iffo Rav’i, someone he had also grown close to in his time in the position of an older brother. Duncan had watched him grow as he himself grew, this relationship was only strengthened as Wrennin had taken Iffo as his padwan learner. Getting back on the right path, Duncan went on a number of outings, missions, learning lessons, though there was less and less of a physical nature that he could learn. So, Wrennin being the mentor to Duncan that he was, offered an opportunity to him. A chance to see the rest of the galaxy, to wet his feet in the real world. This opportunity was to be sent to Diyu, where Duncan’s life would be impacted far beyond what he had expected, with people and items of interest which, similarly, he had not envisioned. Though the details precise details remain, to this day, in Duncan’s personal journal, the information imparted upon this story is a brief recollection. Duncan’s original destination had been to an apartment, which he visited, meeting the inhabitants of a raging party. Though he was given many offers, a political bodyguard, a boloball player, spice trafficking, the job to make a woman’s ex-boyfriend jealous – though there was one matter of more importance than the others. Duncan was ushered into a back room, speaking with a rather plump Rodian who wanted him to procure an item from an auction. Staying true to Duncan’s initial goal for adventure and exposure to the world, he accepted his offer. Duncan arrived at the auction, many items were up for sale and as it happened, he did not receive the intended item. He had different ways upon which he planned to acquire it. This would’ve been the next step in his journey, had he not met a woman, asking for his help. He was told to meet her at a certain address in a certain part of town. This, Duncan did. He learned her name was Sanna – a name which he will not forget within his lifetime. He met the girl’s mistress, she had a task, to acquire a painting from her previous, extravagant lifestyle which she had been forced out of. Though teetering on the side of theft, Duncan once more agreed to this offer. He scoped out the warehouse, including the inhabitants within, only to discover the majority of paintings had been replicas. Fakes. He returned the following night, still true to his word, to this stranger of a woman. Circumstances did not favor Duncan, however, as he was caught. Typical of his style, his attempt to talk his way out, for once, failed. As the room went black, he could feel a sharp pain in his side as he was electrocuted. When he awoke, it was to the sound of a familiar voice – the proprietor of the warehouse. He was in an unfamiliar setting, thought most comparable to a prison. After the man had a brief conversation with Duncan, he left. The Rodian, under interesting circumstances, had arrived once more. The one who had initially given Duncan the offer to procure an item from the auction. Serving as a distraction, he let Duncan slip free, from which point he made his way, immobilizing the guards. He retrieved his hilt, making his way back to civilized Diyu. On his return, he met Sanna once more on the side of the street. After Duncan’s failure to return, having been captured, her mistress had thrown Sanna out. Over time, Duncan had grown an affection for Sanna, one that she had similarly shared with him. Though she refused to take any credits from Duncan, she did take the commlink he proffered her in the event she ever had a want or need to contact him. They departed with a hug, her own story looming in the mists of unknown. Duncan, however, returned to the enclave to recount this tale to Wrennin, one that, as per custom, a sly grin and light laugh would accompany. In the following cycles, Duncan found himself training as per usual, making his way to the cantina. He spoke with Iffo, sitting in one of the booths within the cantina. They discussed trivial matters for a time, merely recollecting and sharing tales, laughing, enjoying the company of one another. Iffo was called away, for he was a ranger to Rannon, part of his personality, he had a love for the wild and to care for all within it. A howler attack had taken place, one fatality, it was his job to respond. After the two bid farewell, Duncan watched Iffo depart with his loyal companion, Gusta. A hybrid between a Kybuck and Taun-Taun, an animal whose presence Duncan enjoyed, similar to Iffo’s. Just as Iffo was whisked away, as was Duncan as he received a rather distressing signal from the very comm-frequency that Duncan had imparted upon Sanna. It is at this point that the shadow of irony and satire meet upon the folds of what some might call destiny – an interesting series of events that would later be looked back upon with a faint sigh and loss of breath. He flew back to Diyu in his starfighter, making his way with haste to the location of the comm call. He was thrown around from location to location as he searched for Sanna, beginning at a bar, to a prison where he encountered the man who had spoken over the commlink, the tale of distress was just beginning. The man had been put into custody for starting a brawl, a fact that Duncan ignored too quickly as he questioned the man. Crafty, was this character who Duncan had little to no knowledge of. He claimed he had Sanna hostage, dying slowly from loss of blood in a location only he knew of. This immediately piqued Duncan’s interest, the man revealed his hands, removing the gloves to show his bloodied finger nails, a testament to his statement. The actions Duncan was to take in the following moments were not his brightest, nor proudest, but he never came to regret them, for what he did, he did with virtue and love in mind. He asked for custody of the man, the officials refused. Tricking one of the guards with Telepathy, rather than brute force, he released the man from his cell, in short order they made their way out, Duncan employed numerous abilities, such as Telekinesis, in order to ensure that none would follow them – yet harming none. They arrived at the spaceport, the man was to make his way off planet, this was not the arrangement. Duncan spoke with him, his own frustrations brewing in an otherwise calm and comical personality. The man had deceived him, he had not captured Sanna. The blood on his nails were from the bar scuffle, Sanna had simply sold the commlink to the man in order to purchase a ticket off world to visit Duncan himself. The man walked off with a grin on his face, Duncan could not take action against him for he had sprung him from jail in the first place. Just as hastily as the man had left, Duncan similarly made haste for Rannon to find the woman he had traveled the galaxy to find. He arrived at the local settlement, asking a number of strangers. They had seen her, it was good news. Yet, she was barefooted, looking in distress as she was enveloped in dirt. No one would offer her transport to the Jedi enclave, she could not afford it herself as she had no credits. A creeping doubt entered Duncan’s mind, though he dismissed it, what a fool he had been. She had been making her way to him all along, she was likely waiting back at the enclave already – he decided to walk his way up, however. Following in her footsteps to confirm she had made it. He slowly made his way, coming upon a clearing he noticed a torn pouch on the ground, as well as a small bunker. The trail ended here. As he approached, he saw the comforting sight of Gusta, along with a familiar voice. It was Iffo – he had responded to the howler attack, what a surprise it had been to see Duncan in the same place. The lurching, hidden feeling within Duncan grew as he came to realize what his journey had led him to. Words that came from Iffo seemed to slow, taking them in nonetheless as time itself seemed to halt. Iffo introduced Duncan to the victim as they strolled inside, he took away the cloth upon the body. He stated that no one in the area could identify the woman, but that she had come in from an off world planet, not from around Rannon. As Duncan saw her, regardless of the various injuries present from the howler attack, he sunk to his knees – Sanna hadn’t made it after all. Iffo was stunned, they spoke for a time. He left Duncan to pay his respects before making their way back to the enclave. Duncan was comforted, though little could make sense to him at the time. He was not angry, or depressed, but merely stunned, halted in his tracks. This tale had long since been over before it had officially begun. Solemnly, Duncan took care of her funeral requirements, for he was the only one to have known her, no family was known. Sanna was gone from the world, but she lingered on in Duncan’s thoughts. Just as this is the story of Duncan, to be remembered in this writing, Duncan will continue to bear the tale of Sanna, even if he is the only one to know it. Slowly he grew, it may not have been the most pleasant of experiences, but he took solace in the fact that he would keep her in his memory. To this day, he still has stray thoughts in his head of what she may have been thinking in her final moments, was it perhaps that Duncan hadn’t made it in time to save her? Thoughts that would only detract from all the progress he had made, though they lingered in the recesses of his mind, he refused to indulge them after a time. Instead, he began to take up his regular mantle of training, rejoicing with friends, telling tales and having a good time. Eventually, this effort would be recognized. There were many events to take place between the conclusion of that tale and the one to next be told, though it is this chapter in Duncan’s life that was perhaps one of the more enlightening moments as he found himself elevated to a new position. Long time friend to Karmarie Zar, Duncan was called to the hangar as Karmarie’s mentor, Cael Dan’kor, the man to have slain the Dark Lord of the Sith, had news for them. A man by the name Vexus Perator had escaped a Force sensitive rehabilitation center, slaying a Jedi Knight and youngling in the process. Duncan had only heard his name before, but Karmarie was more aware of him as he had dealt with his father and him before in a mission which won’t be detailed here. Master Dan’kor wanted the pair to accompany him in the event things went sour and he needed backup, they made their way to the indicated location where Vexus knowingly awaited. As they received the call to progress from Master Dan’kor, Karmarie and Duncan made their way through the facility, sifting through Imperium troopers bodies, loyalists from the war. Though, they did encounter the living as well, fending them off at numerous points in this journey, as well as Vexus who made himself visible when he so desired. This eventually led them to an open area, upon which Duncan and Karmarie engaged Vexus in a fight. Though a long, drawn out process, they had defeated him, sparing his life. Duncan took his hilt as a reminder of that day and that trial of his life, hanging the slumbering Vexus over his shoulder to once again bring him to justice. Karmarie recovered Cael, who had been severely burned in a fire below. They made their way back to the enclave, afforded a moments rest as they all went to rest from the day’s excruciating endeavor. The immediate day that followed this, Duncan came to speak with Wrennin. The topic naturally seemed slightly off, as the area around them began to clear. The typical smirk and laugh was accompanied, this time, with language of the past, of accomplishments. They slowly made their way down to the ceremonial hall, where everyone was waiting. It wasn’t long before both Duncan Therin and Karmarie Zar were called forth by the Jedi Council, in front of their peers, to be recognized. By the Will of the Force, Cael Dan’kor, Amalia Feyn, and Wrennin Vae, in the presence of many, after years of training and trial after trial, they were given the rank of Jedi Knights of the Order. And as they rose, Duncan couldn’t help but feel an unmistakable presence with him, a hand on his shoulder – though the exact person is a mystery for this story, it was a presence both Duncan and Wrennin likely felt. As Duncan came to his feet, awash with people around him and a laughing Wrennin, he couldn’t help but feel a very simple emotion; he was content. After the ceremony had concluded, the enclave was bustling with life. Even Iffo, who had taken himself off the Jedi path to traverse the galaxy, had made himself known through a holo-call by the request of Wrennin. Though a rather scrupulous Bimm ended the call promptly, the pair were able to share a words and a smile. The days following were rather busy, a new energy had taken the enclave by storm. Duncan took up his new duties quickly, refusing to be called ‘Master’, though eventually slipping into the title as he grew weary of batting away encounter after encounter where he was named such. Taking a profound interest in the expertise of diplomacy and Force mastery, he started to teach such arts. In combination with his excellent technique with the lightsaber, his path wasn’t clear, but it certainly folded to many different intersections upon which he could choose. As an example, he became the diplomat liaison to the security department, which his long time friend, Karmarie Zar was now the head of. Whilst there are many different opportunities ahead of him now, this can be marked as the official climax to the story which is Duncan. Less than a year after his knighting, Duncan assumes the role of Sage Master from his predecessor Silas Vir’n. He revolutionizes the role, creating an ordered ranking system, endeavoring to analyze the mysteries of the Force whilst involving those involved with the department. Little did Duncan know how often he would be called up to serve in his role, despite relative inexperience given he was a fresh Knight. In the wake of the Imperium War, there were still matters unresolved. One of these matters came to the attention of Duncan when Jedi Master and High Councilor Amalia Feyn employed his help, along with comrade Jago Mirax. The crystal which was used in the Coruscant temple at the end of the war which caused so much damage and chaos was now in the hands of the Rannon branch. It had formerly been a project of several Ossus Jedi to figure out how to destroy the crystal, as it was deemed a weapon of mass destruction, with potential to do as much damage once more as it had previously. Duncan and Jago were assigned, as Sage Master and Master Artisan respectively, to figure out how to destroy the crystal. This process was ultimately solved as the pair decided that cutting the crystal up into micro sized bites and shooting them into a star would destroy the small bits. Amalia, Duncan, and Jago all assembled to see the crystal off on a voyage, acting as interested parties and security, although the likelihood that something would happen was low; nonetheless, something did happen. The former team of Jedi who were working on developing a way to destroy the crystal had become tainted by the presence of the crystal on their mind and became fallen Jedi, because of this, they boarded the ship which Amalia, Duncan, and Jago were on, and confiscated the crystal. Though the exact events which transpired are on official record, the resolution saw an injured Amalia Feyn, Duncan, and Jago travel to Coruscant and apprehend the Jedi who were planning to unleash the crystal’s devastating potential once again. After this incident, Amalia transferred to the Ossus branch, as dealing with the crystal was her last act as a Councilor on Rannon. Duncan would once again be called upon due to his position, except this time by Iffo Rav’i, a newly made Knight of the Order. Iffo had need of Duncan to travel to Achia 7H7 to investigate a disturbance, Achia was a new planet in the eyes of the Galaxy. Though Duncan saw a lot transpire during his time on Achia, he found that he ultimately gained a greater affinity for the Force, as well as protection from the Force itself. He discovered relics dating back to 20 ABY, as well as communicated with a former Jedi Knight known as Subaira’enexes. Though the exact details of this entire encounter are completely off record, there are several mentions to the word ‘Mist’. The exact location of Achia 7H7 is no longer documented in official records. An odd outcome of this event is that Duncan was known to have become temporarily addicted to the drug known as ‘spice’. Around this same time, a long time comrade, someone who had been an initiate at roughly the same time as Duncan, Dithaal Moomo had departed the Jedi Order and resigned. Duncan was left with part of a necklace, a number of other bits which were distributed to Dithaal’s closest friends. Though Dithaal left the Order, he did have a severe impact upon Duncan as a child, and even as a mature friend when they were adults. As time went on, Duncan seemingly had finally fallen into his role as a Jedi Knight entirely. Around eleven years after his Knighthood, Duncan decided to take Dorian Reyn on as his Padawan Learner – an experienced Knight, though his first Padawan. The experience would provide him with a great deal of learning as he became the personal tutor to a young Omwati boy, aged ten at the time of his apprenticing. It would become Duncan’s goal to see Dorian reach the mantle of Jedi Knight and continue to provide sturdy instruction to do his part in ensuring the Jedi Order continues. 330.01 ABY – Date of birth. 338.14 ABY – Initiated on Yavin IV in the presence of Alehk Thol. 340.12 ABY – The Yavin Branch moved to Rannon. 341.09 ABY – Passes the Initiate Trials, noviced alongside Deija Quor and Ilaine Strias. 343.02 ABY – Apprenticed to Motoko Isawa. 343.20 ABY – Departs the enclave due to homeworld strife. 344.11 ABY – Returned to the enclave. 346.16 ABY – Negotiates a land deal with the Ya’Kada people for construction of a Jedi outpost. Construction begins the day after, the Ya’Kada people gain a voice in the Senate. 347.26 ABY – Severs apprenticeship with Motoko Isawa. 354.24 ABY – Knighted in the presence of Amalia Feyn, Cael Dan’kor, and Wrennin Vae. 365.10 ABY – Apprentices Dorian Reyn. 371.20 ABY – Duncan Therin dies whilst on assignment.